Winter tends to elicit mixed feelings. As temperatures drop and snow falls, some people love to bundle up and walk in the brisk cold. To many others, winter is a miserable few months. Regardless of which part of the spectrum people fall on, there is the general consensus that winter road and sidewalk conditions make it difficult to enjoy this season. While walking to school you slip at least five times, you’re frozen by the time you arrive, and getting to classes seems to take a lot longer than you remembered. Getting around in the winter is usually a pain for everyone. On a scale of one to ten, most fall close to the “love skiing, skating, and sledding but for the love of God, winter, go away” side. But for many, winter has some serious challenges that come from needing a mobility device. When the pathways and roads of McMaster are icy, slippery, or wet, many people with crutches, canes, walker, and wheelchairs face a whole new campus. 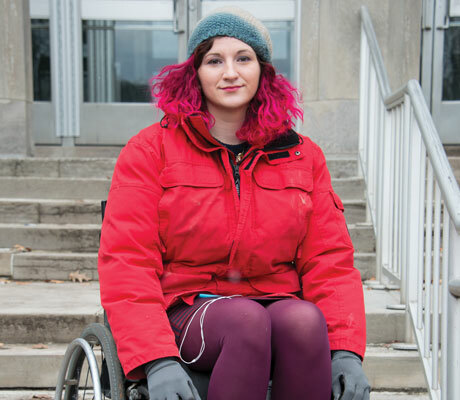 Second-year student named Sophie Geffros uses a manual wheelchair to get around campus and finds that in wintertime, she’s spending a lot more time commuting between buildings. In -38 C, where exposed skin can freeze in three to five minutes, 15 minutes in the cold can seem like eternity. Even getting to campus is a struggle if you have a mobility device and take the bus. In extreme cold weather, sometimes the automatic ramp on the buses don’t work, making it inaccessible for that day. The Student Accessibility Services office at McMaster helps students with any special needs including medical issues, physical impairments, mental health issues and learning difficulties. “I think the main issue is that SAS is primarily designed to deal with students with learning difficulties and they do a good job accommodating academically but when you faced with mobility impairments, and you say that you need this thing, they don’t have much practice with providing people with help in that way,” said Geffros. SAS does help with services such as note-taking and extension leniency but unfortunately, it doesn’t always help when someone is already on campus. Even students without mobility impairments have experienced difficulties walking across some parts of campus that are extremely icy and have not been salted or opening doors that have small banks of snow in front of them. “There’s a huge problem with where they put the snow once they shovelled it off stairs and sidewalks. First it takes them a long time to get it off the sidewalk, then once they’ve gotten it off… they cover the smooth bit of the curve which is where, if you use a mobility device, you need to go down on the curb on and you can’t because it’s covered by a chunk of ice,” said Geffros. “There should be more areas that are treated as constantly as others since small paths are just as important as large streets,” says Jamie Lai, the Abilities Coordinator for MSU Diversity. These conditions are not only annoying to navigate around, but they can also be dangerous. 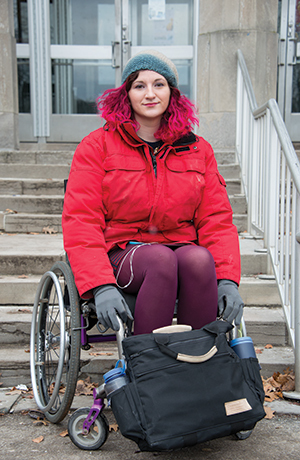 Third-year student Georgy Dhanjal uses a power wheelchair to get around campus and says that getting to classes increases from three to five minutes to eight to 10 minutes in the wintertime. Although he can navigate on top of snow more easily than he could with a manual chair, the icy conditions on campus still make it a hassle. Getting from point A to B on a reasonably sized campus should be simple, but when the conditions of campus are subpar, it becomes an issue of safety rather than convenience. For Geffros, unclear pathways can cause physical injury while trying to navigate through the ice and snow. “The actual pavement is very poorly maintained, especially in the quad. There are big chunks of cracked pavement. In the summer you can navigate around but in the winter you can’t see it, and it looks icy but clear but then you go flying out of your chair. Quite a few times I have actually gone flying, landed on my face, books everywhere, sometimes my wheelchair has rolled away,” she said. On extremely cold days, most of us are concerned about getting to warmth as quickly as possible, but there is the added pressure of having to navigate around potential hazards. “I have seen some people in their wheelchairs going against traffic because sidewalks and pathways are inaccessible,” says Lai. “There’s a large emphasis on people who require wheelchairs, and there are also people who use walking aids and who are visually impaired who need their paths to be clear so that they don’t risk injury. Those who use walking aids, even temporarily, can find that even though they never get stuck in the snow, they sometimes have to rely on other people to get around,” Lai continued. “I had crutches in the fall and found that some of the automatic door buttons don’t actually work and I’d have to find a way to manoeuvre. I can’t imagine having to do that outside in freezing temperatures,” said fourth-year student Hans Loewig. At times, it just isn’t possible to get through campus without a little help. Dhanjal encourages students to get in touch with services like SAS that can help them in the winter. “I think that those who begrudgingly attempt to navigate campus during the winter time, and do not know of these services too well, may seem uncomfortable asking for help. The truth is that these services are great sources for assistance, and I definitely recommend seeking their assistance when necessary,” says Dhanjal. Friendly students are also an option to help if you find yourself stuck in the snow. “Fellow students are the best when it comes to assistance. If my chair tires get stuck in the snow, or if perhaps I need a push to get across some ice, there is always someone I can count on at this school, stranger or not,” says Dhanjal. Since most people are busy trying to get to their destination as fast as they can, it can help if more people are alert to their surroundings. “Last week I was constantly stuck in the snow, I had to flag people down to help me, otherwise I would’ve just stayed there,” said Geffros. Winter is great for a lot of things, like hot chocolate, hockey, and candy canes, but it really is the worst for making your way around. Some people can walk over that crack in the ice, or step over the snow bank, but for others, getting across campus can be a frustrating and time consuming feat. Take the extra time to help someone whose chair is stuck in the snow or guide someone with a visual impairment around the icy parts of the sidewalk.